Today I received notification from La Fédération des Vins des Nantes that the 2018 Ban des Vendanges for Muscadet will be issued on Monday 3rd September. This means that producers can start picking from Monday if they wish. 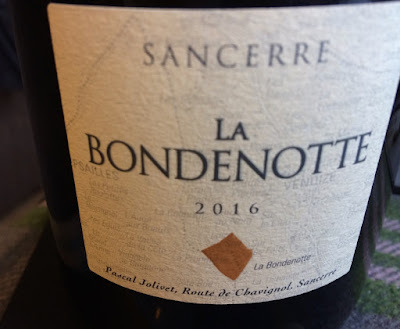 Although this is quite an early start, it is a little later than last year as the Muscadet Ban des Vendanges was issued on Wednesday 30th August 2017 - see post on Jim's Loire from last year. One of the factors behind the slightly later start may well have been the 'Beast from the East' in February and early March. The earliest starting dates since 1981 are 19th August – 2003, 24th August - 2011, 25th August – 1989, 29th August – 1990, 1995 and 1997. 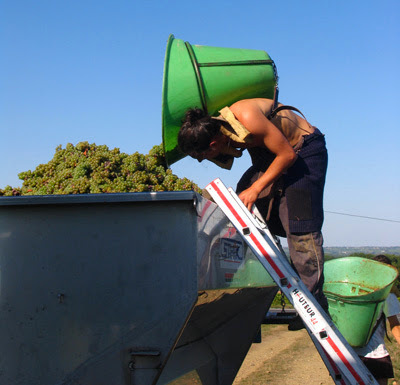 In contrast 2013 was the latest most recent start of the Muscadet harvest with the Ban des Vendanges issued on 23rd September. At the moment the 2018 harvest reportedly looks promising both in terms of quality and quantity. We will be arriving in the Pays Nantais on Wednesday, so will report first hand on how the 2018 vintage is looking. The forecast until Thursday 13th September, which is currently as far as the BBC site goes, looks very favourable with day time temperatures around 24˚C/25˚C and nights around 12˚C. The only rain forecast is for a short period of light rain on Friday 7th September in the early morning. A reasonably sized harvest will be good news after a succession of short harvests. If the quality is there and the weather over the height of the summer after a wet and humid end of May/June suggests it should be, then this will be the fifth year in succession that the Pays Nantais has had a good quality vintage, albeit very small in several years. If indeed 2018 is good, then five vintages in a row will be unprecedented, certainly in modern times. The Press Release also highlights both the incidence of mildew in the early part of the summer due to the rain and humidity, although the dry and hot weather in high summer should have calmed this, and the continuing problem of the fungal vine disease – Esca. La Fédération des Vins de Nantes (1), propose à l’Institut National des Appellations d’Origine, le ban des Vendanges du Muscadet qui devrait être prononcé par arrêté préfectoral le lundi 3 septembre 2018. 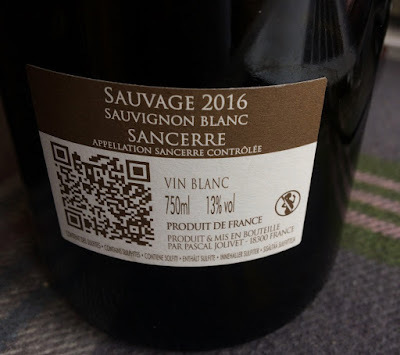 Après deux années de récolte déficitaire, les Vignerons de Nantes sont optimistes avec une vendange précoce qui se révèle globalement généreuse et très qualitative. Suite aux controles de maturité coordonnés par la Fédération qui servent d’indicateurs sur l’équilibre entre le sucre et l’acidité du raisin et évaluent l’état sanitaire du vignoble, les premiers coups de sécateurs seront autorisés, par arrêté préfectoral, pour les vins d’AOC Muscadet à partir du lundi 3 septembre 2018. Le millésime 2018 a débuté par un hiver aux températures de saison mais particulièrement pluvieux. Il est tombé plus de 400mm de précipitations entre janvier et mars 2018. Une pluviométrie finalement bénéfique après deux hivers plutot secs. La vague de froid du fameux « Moscou-Paris » intervenue entre février et mars a favorisé un bon repos végétatif de la vigne évitant ainsi un démarrage trop précoce de la vigne. Le mois d’avril, printanier, a permis un démarrage homogène de la végétation avec un débourrement situé entre le 16 et le 22 avril, plus tardif qu’en 2017. La météo, clémente, a épargné les gels tardifs tant redoutés des vignerons. Le printemps, assez pluvieux mais aux températures douces, a favorisé une excellente pousse de la vigne et la pleine floraison est intervenue du 4 au 10 juin 2018. Une floraison légèrement plus tardive qu’en 2017 mais néanmoins caractéristique d’une année précoce. Elle révéla un bon potentiel de récolte entamé toutefois par quelques attaques de mildiou sur grappes dues à la combinaison pluviométrie et douceur ainsi que l’esca, cette maladie du bois qui détruit malheureusement de nombreux ceps de vignes. L’été, chaud et sec, s’est déroulé dans des conditions idéales pour assurer la maturation des raisins. La réserve en eau des sols, satisfaisante suite à un hiver humide, a évité le stress hydrique. La période de canicule de début août a ensuite laissé place à des journées sèches, ensoleillées et douces ponctuées des nuits aux températures plus fraîches. Une amplitude thermique très favorable au développement du potentiel aromatique des raisins. Les vignes ont pu mener le raisin à pleine maturité pour nous délivrer ainsi une vendange plutôt précoce, dans un excellent état sanitaire et dont les équilibres tant analytiques qu’organoleptiques s’avèrent particulièrement prometteurs. 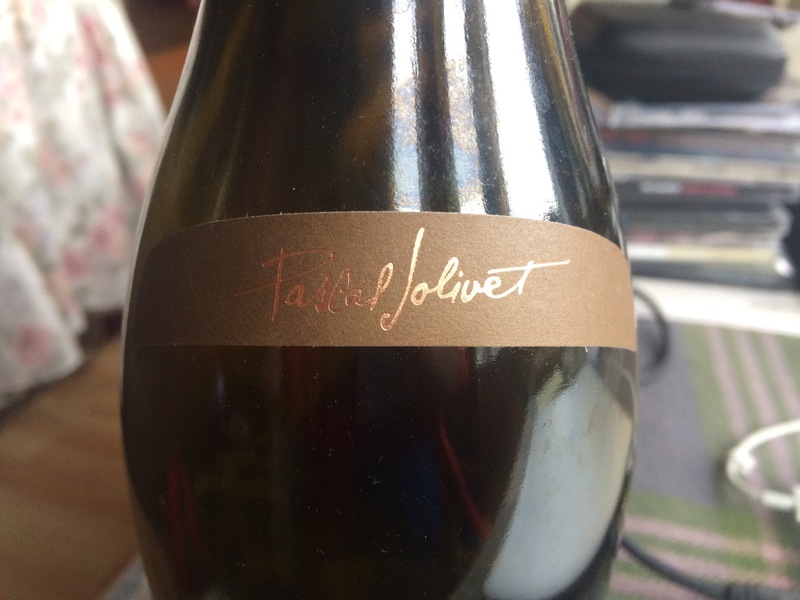 A couple of weeks ago I received a box of samples of his current releases kindly sent by Pascal Jolivet. I have been enjoying tasting them and this post covers the first seven. 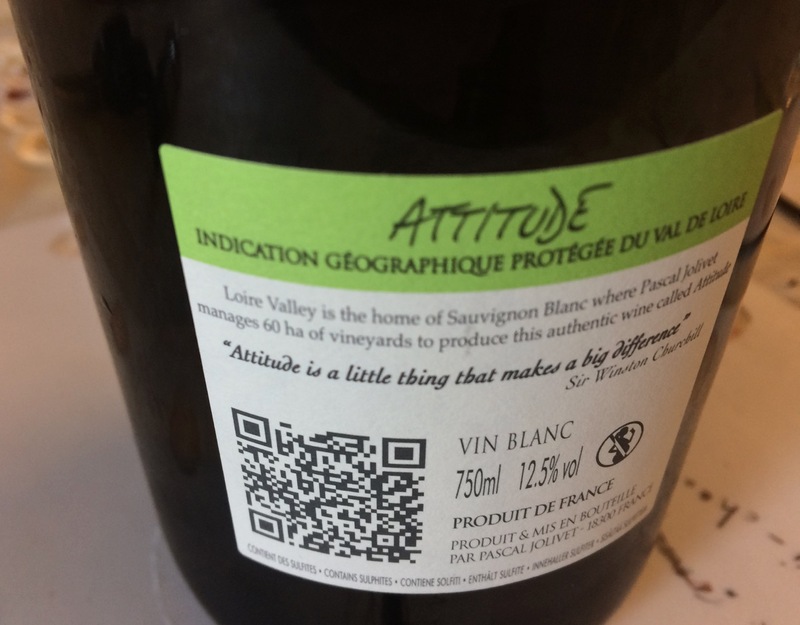 2017 Attitude, IGT Val de Loire Attitude comes from 60 hectares of vineyards managed by Pascal Jolivet with at least 30 hectares in region of Châteaux de Cheverny and Cheverny. 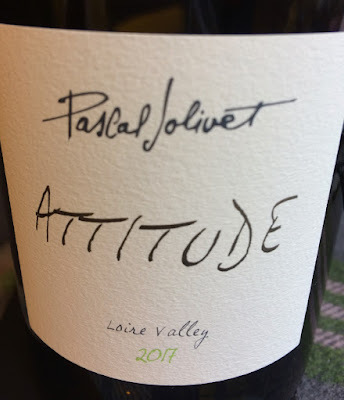 Attitude comes in all three colours – white (Sauvignon Blanc), red (Pinot Noir) and rosé – Pinot Noir, Gamay and Cabernet (a third of each). 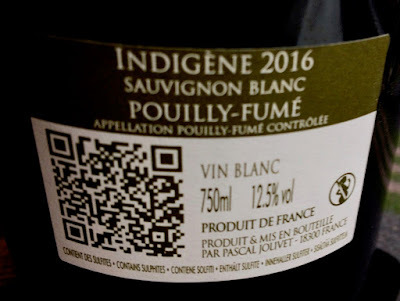 For this Sauvignon Blanc the grapes come from two areas of Chemery (limestone) and little further west Angé sur Cher (flint). The 2017 Attitude has some grassy notes as well as plenty of grapefruit flavours, attractive soft texture and some length. There is an impressive quality of cork for this cuvée. This is from Jolivet's Signature range and is a blend of Sancerre three different types of soil blending 50% limestone (caillottes), 30% clay limestone and 20% flint. 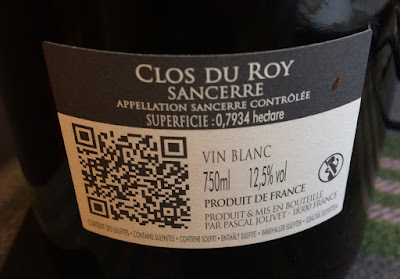 It has weight and concentration, is quite flattering but without the complexity and finesse of the Clos du Roy. 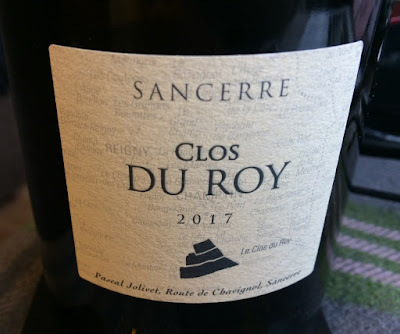 The 18-hectare Clos du Roy is in the commune of Crézancy of which Jolivet has 0.8 hectares of this clay-limestone vineyard. This Clos du Roy spends four months on its fine lees. 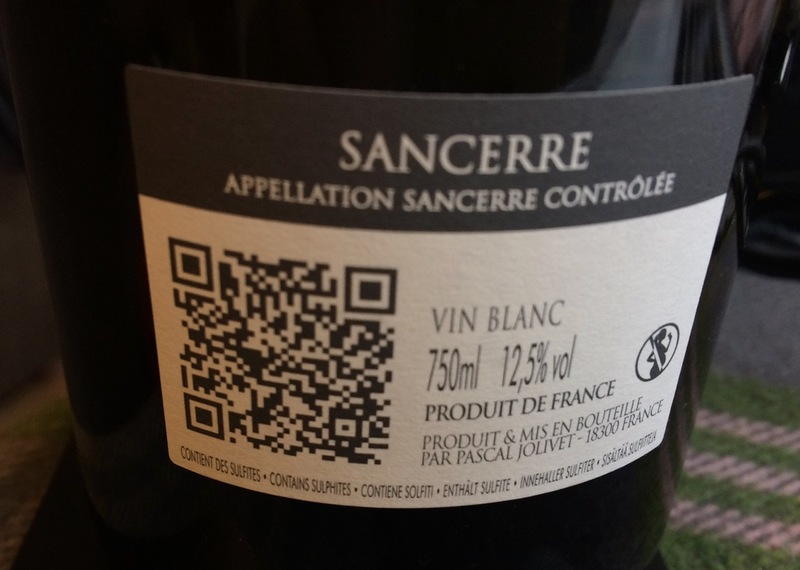 It has a citric lightly grassy nose, finesse and elegance, delicate and well balanced Sancerre. 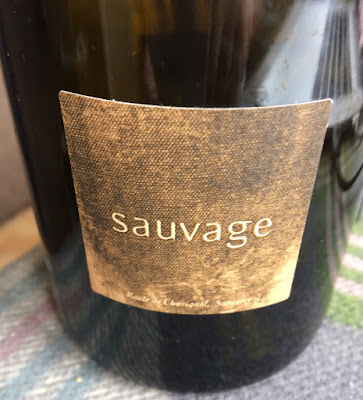 Sauvage comes from two hectares of organic old vines between the villages of Champtin, a hamlet to the west of the village of Bué. It stays for 12 months on its lees before bottling. The 2016 Sauvage has the potential to improve further. Sauvage is very precise and clean with a mineral character. Grapefruit, citric, good length with a significant length and quality of cork. The grapes for this cuvée comes from old vines planted on flint in the small village of Tracy sur Loire, which is just beside the Loire. Vinified in stainless steel Indigène spends 12 months on its fine lees. 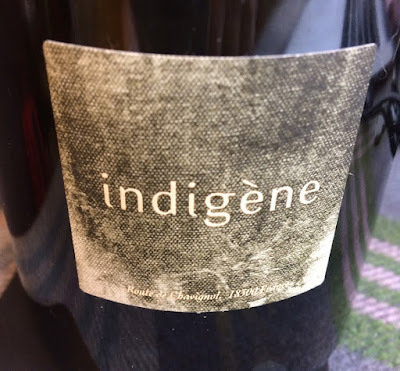 The 2016 Indigène is delicate, with citric flavours, especially grapefruit. Perhaps needs more time to take on more weight? The Pinot Noir for La Bondenotte from 0.86 hectares of vines owned by Pascal Jolivet in the three hectare La Bondenotte (clay-limestone) in the Bué commune. It is matured for eight months in demi-muids (600-litre barrels). 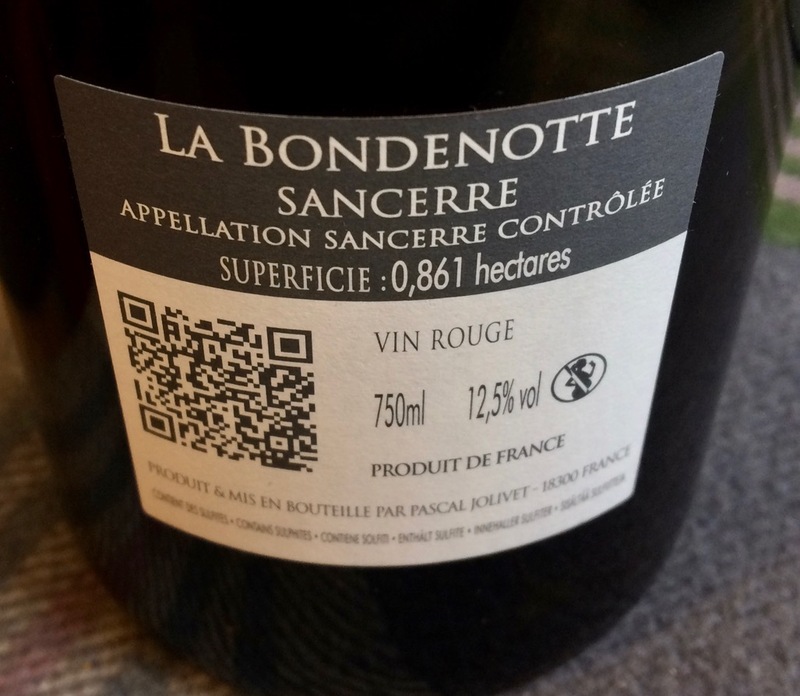 La Bondenotte is a lighter style of Sancerre Rouge with raspberry fruit very much to the fore. The Pinot Noir for Sauvage comes from a one hectare vineyard in the centre of the commune of Bué, whose old vines were planted in 1952. It is vinified in demi-muids (600-litre barrels) where it is aged for 15 months. 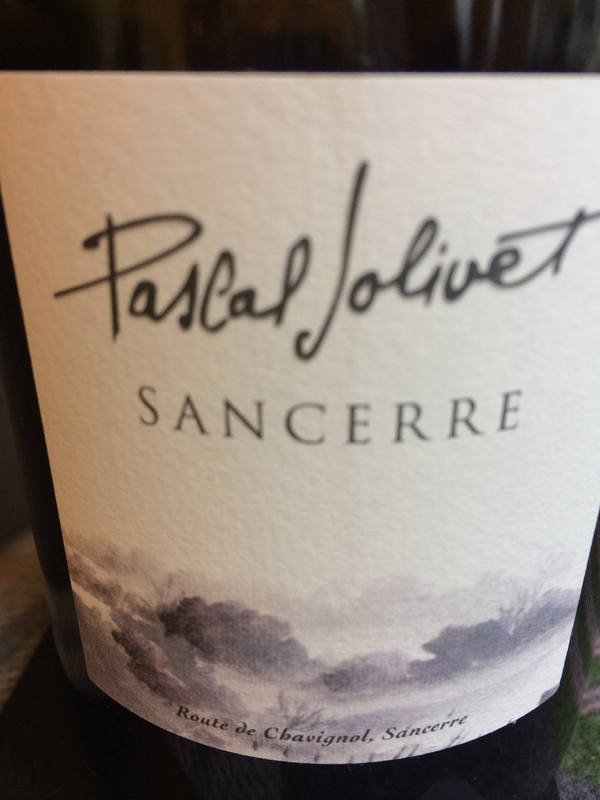 This is an impressive and serious red Sancerre – silky, seductive with good concentration and has the potential to age and improve further. Having two Portuguese friends visiting Scotland for the first time we thought that, despite the beauties of the Scottish Highlands and the West Coast, they might come to feel a little homesick, especially with the shock of coming from 35˚-40˚C Faro to 20˚C max Scotland. With this in mind we laid in a trio of Vintage Ports to entertain them. Two came from Taylor and one from Cockburn, so two from a company founded by an Englishman – Peter Bearsley – and one founded by two Scots – Robert and John Cockburn. We drank the three Ports in turn over several days – moderation always ensuring that we could try them again on the second night. 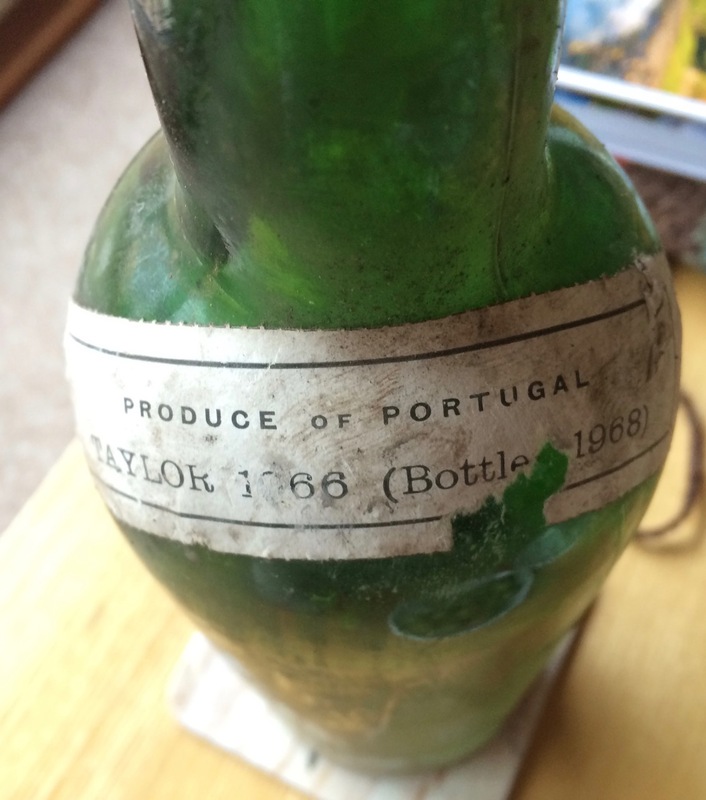 Our 'Portable Scotland' began with the 1970 Vintage Port from Taylor. The two wines from Taylor are part of a generous legacy from one of my godfathers. The label had disappeared. 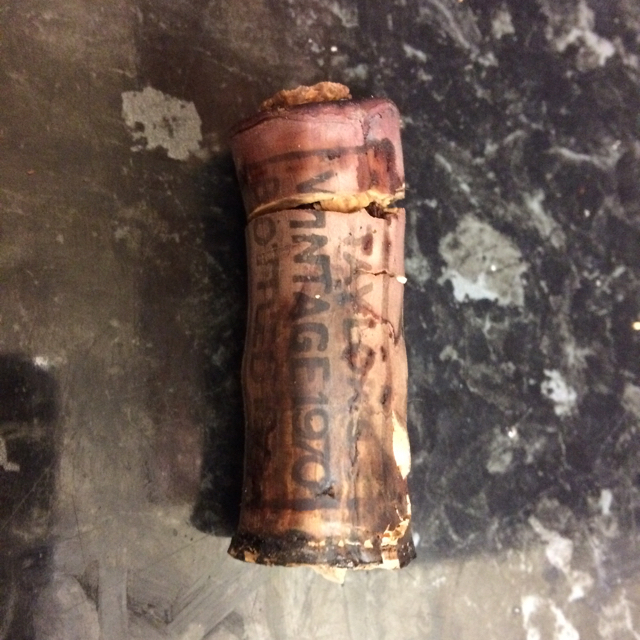 I could only identify the bottle by the stamped on details on the top of the lead capsule and then by the cork, which remarkably came out complete – a rare occurrence I find with an old Port. All too often the last part of the cork snaps off. Yes, I do have a cork fork remover but unfortunately I left it behind in London. The 1970 Taylor was still quite youthful but on the first night the alcohol in the finish was surprisingly noticeable. This lessened the longer the 1970 was in the decanter. It also opened up. Drinking the rest on the second night the whole balance was better with additional weight but still some alcohol in the finish. The 1970 Cockburn was the big surprise. I had assumed that the Cockburn 1970 would be the least impressive of the trio, so had sandwiched it between the two Ports from Taylor. In fact it was quite the reverse as the Cockburn was sensational with lovely balance between the fruit, alcohol and acidity. Initially the fruit seemed a little two-dimensional but it rapidly opened up and broadened up. 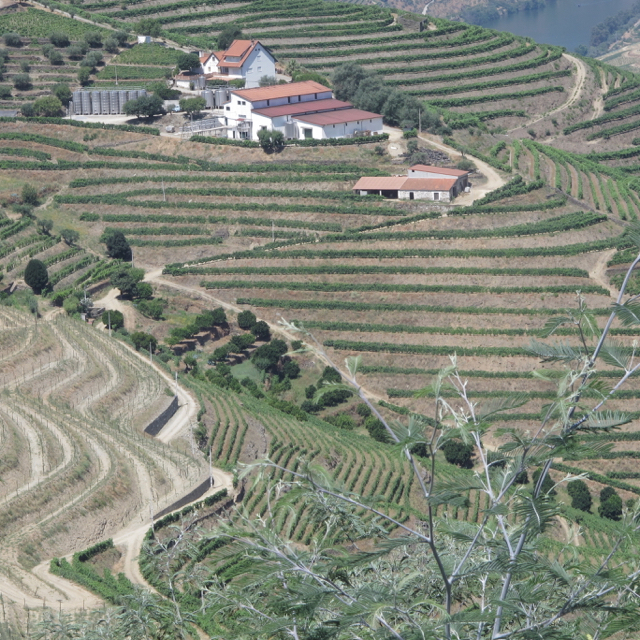 A great Vintage Port with the potential to last many more years from a time when companies were still allowed to bottle Vintage Ports outside Portugal. The main label of this 1996 Vintage Taylor's Port has been missing for a while. This may be, like the Cockburn Vintage, a London bottling. 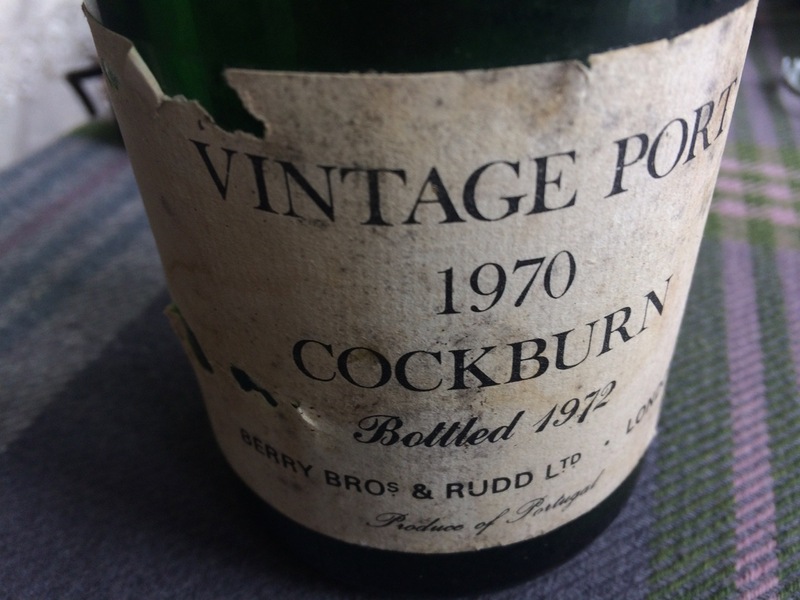 This 1966 had impressive, concentrated, supple and decidedly youthful cherry fruit – long and seductive – but like the 1970 from Taylor the alcohol in the finish was quite present and not seamlessly integrated as it was in the Cockburn. Again on the second night the alcohol was in better balance. Summing up the 1970 Cockburn was clearly the best of the trio, followed by the 1966 from Taylor and then their 1970. On Thursday 9th August we had a return fixture lunch at the Rocpool Restaurant in Inverness. 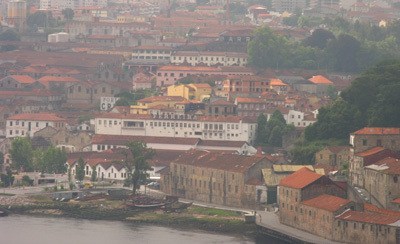 We met up with friends from Aberdeen and were with two friends from Portugal. Being six allowed us to explore Steve’s interesting wine list in more detail. We kicked off with a bottle of the crisp and refreshing 2017 Albariño, Rias Baixas from Paso Senorans. 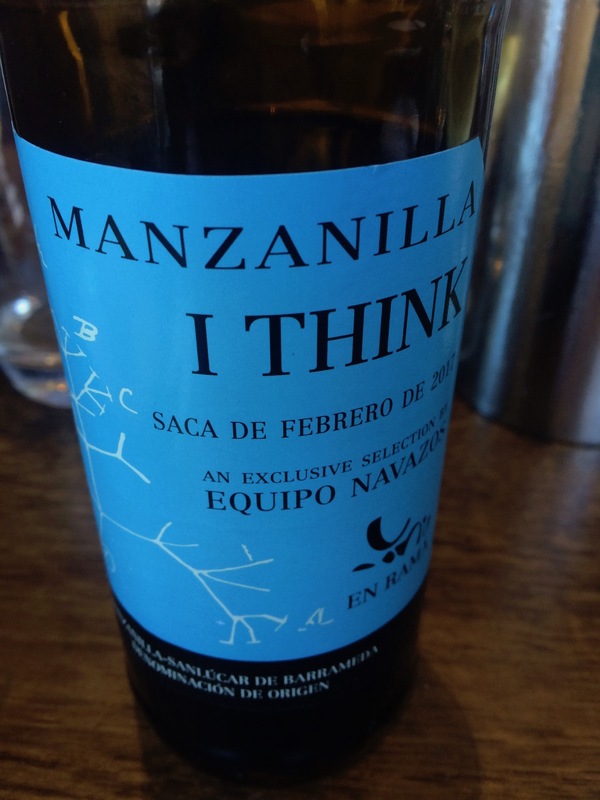 In between time we went for a chaser (a couple of glasses between the six of us) of I Think Manzanilla Rama from Bodegas Navazos. 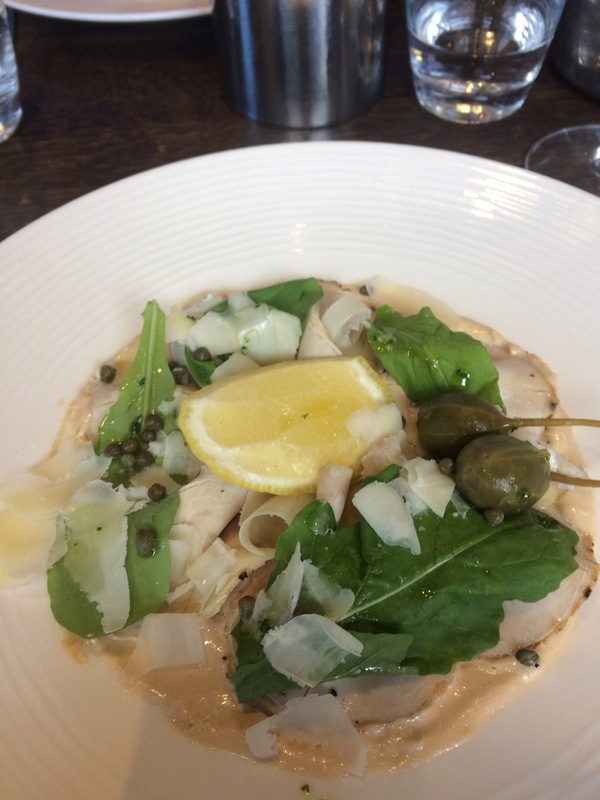 Once again we chose the excellent and very fairly priced £16.95 two-course lunch menu. The quality of the cooking is very good and successfully imaginative. 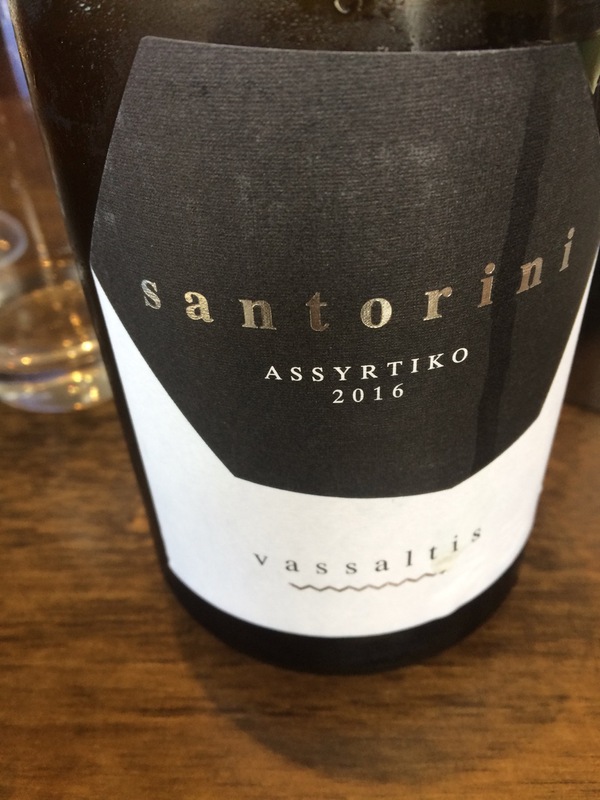 Finding that the Albariño had emptied rather quickly we ordered the very impressive 2016 Assyrtiko, Vassaltis, Santorini, with good concentration and lovely balance. Impressive wine. In anticipation of our main courses we selected two Italian reds. First up: Rapace, Uccelliera, Toscana IGT, Montalcino, 2011, Rapace is a blend of 70% Sangiovese, 20% Merlot and 10% Cabernet Sauvignon. Rapace translates as rapacious. 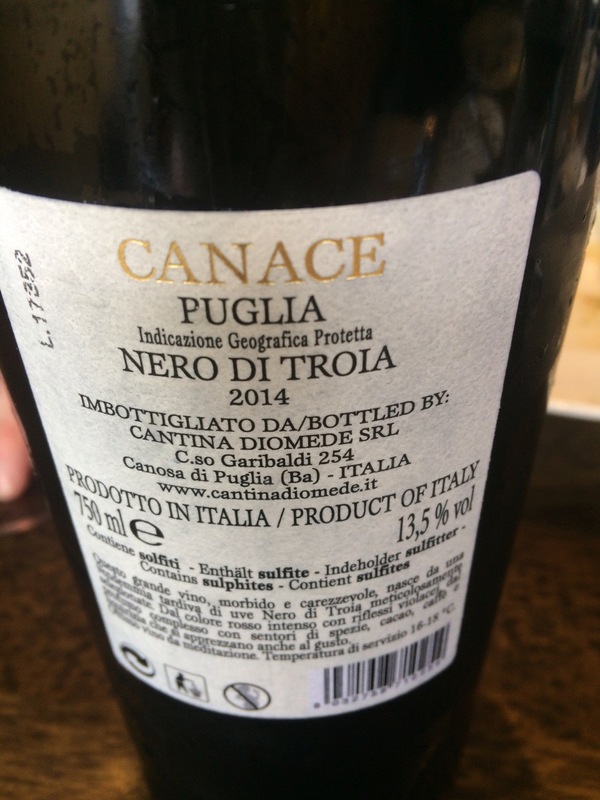 This may have been a fitting description of our lunch party, at least some of us, as we enjoyed and duly dispatched this concentrated, elegant and well balanced red – powerful but with good freshness in the long finish. My main course followed the quality of my first. I opted for the honey & lemon glazed breast of chicken with Moroccan spiced couscous, almond, sultana & fresh coriander with a cucumber & garlic tsatsziki. I don't often chose chicken in a restaurant – mainly, I think, because I often cook it at home. 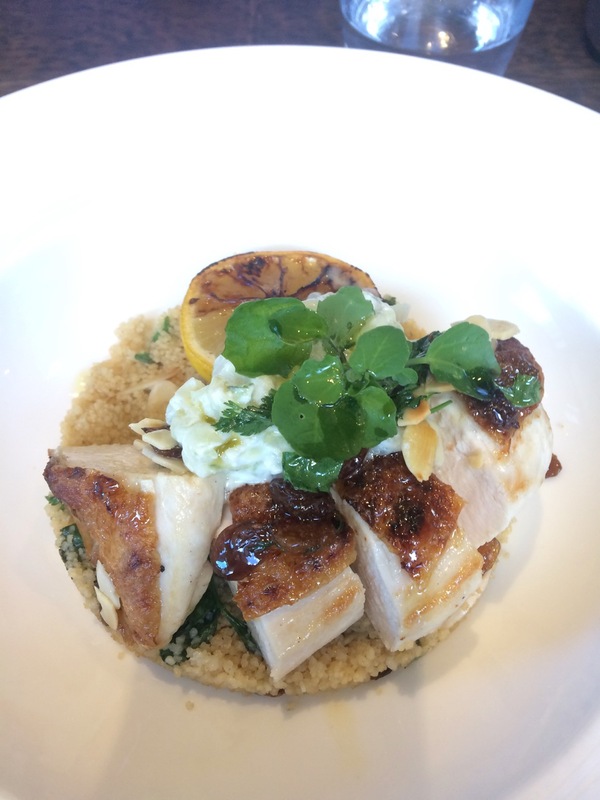 My chicken was nicely moist and succulent and nicely balanced by the spiced couscous. 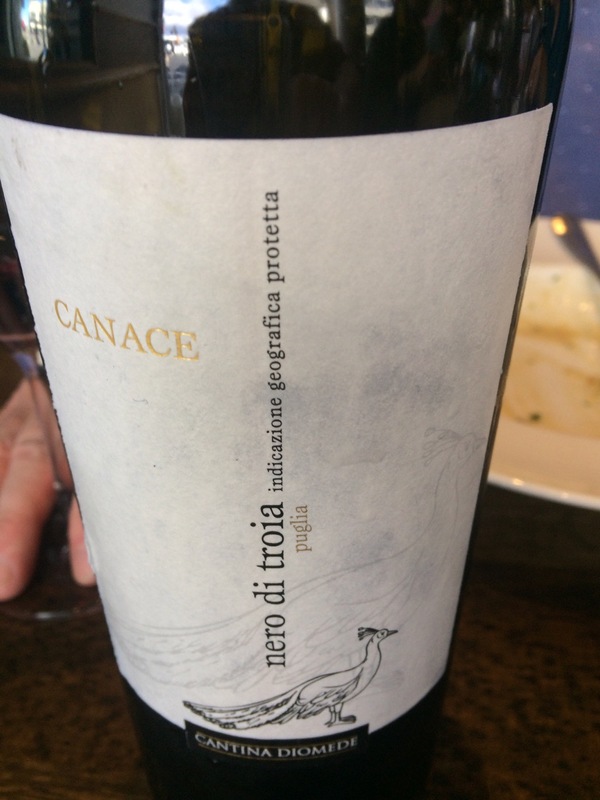 Our final wine choice was the 2014 Canace from Cantina Diomede in Puglia and is a blend of mainly Nero di Troia with a small amount Aglianico to provide freshness. The grapes are partially cut and allowed to dry on the vine. This gives a powerful, concentrated red with chocolate and black cherry notes. 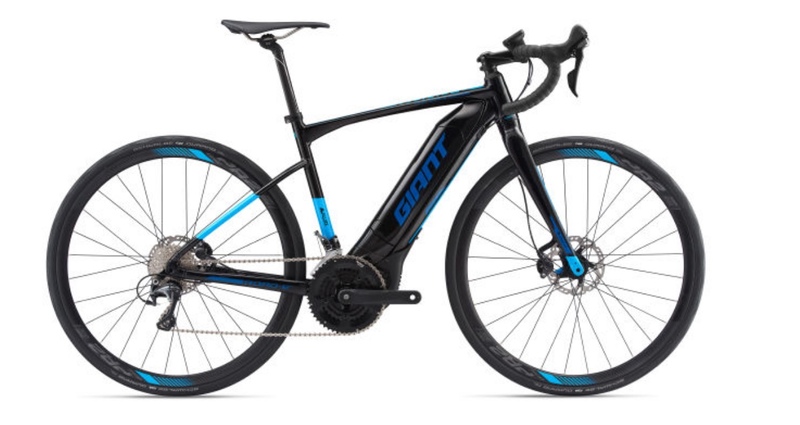 With the 2018 edition of Le Tour finishing in Paris last Sunday this seems a very appropriate moment to praise cycling and, in particular, e-bikes. I will make no mention of the outcome of this year's Tour as I have no wish to propel one of this blog's supporters to apoplexy. Nor is there any suggestions that those who rode Le Tour had any electrical assistance. You might reasonably wonder what e-bikes have to do with wine or, indeed, other alcoholic drinks apart from both drinking wine and riding a bike generally being pleasurable activities. The link is I contend health. Regular cycling, whether purely for pleasure, exercise or commuting, brings many health benefits including reducing weight, reduces the risk of diabetes type 2, strengthening your heart, increased cardiovascular fitness, increased muscle strength and flexibility, and there is some evidence that it can reduce certain cancers such as bowel and possibly breast. This web page from the Government of Victoria (Australia) gives a good summary of cycling's health benefits. It is true that other forms of exercise, in particular walking. 'We found that cycling to work was associated with a 41% lower risk of dying overall compared to commuting by car or public transport. Cycle commuters had a 52% lower risk of dying from heart disease and a 40% lower risk of dying from cancer. They also had 46% lower risk of developing heart disease and a 45% lower risk of developing cancer at all. The full study was published in the British Medical Journal. of course The Netherlands, Denmark and other countries are far in advance of the UK in facilitating and encouraging cycling. The longer we can remain fit and healthy the longer we can enjoy wine, en modération naturellement, and if we can extend our life span we have the chance of trying and enjoying more bottles of wine. Furthermore I think it is highly likely that someone who is feels good will get more enjoyment from a glass of wine than someone who is unwell. When I was in my 30s I spent many hours on a bike not only commuting but also training for time trials. I used to seek out steep hills as well as some of the classic mountain climbs used by Le Tour including Le Tourmalet, L'Alpe d'Huez and Le Ventoux. Although I was never particularly quick along the flat I was able to climb with some facility and fluidity. Gradually my waist expanded – 32" trousers ceased to fit, then 34" suffered to same fate and I moved onto 36". I still did a certain amount of walking and we cooked fresh food eating reasonably healthy avoiding processed food. Happily this meant that my gradual weight gain wasn't catastrophic but it was enough for my partner to observe that I was becoming 'portly'. I was shocked in September 2012 to be diagnosed as borderline Diabetic Type 2. I resolved I had to do something – enough was enough! I started going to our local gym every day and a few months later bought a mountain bike – great fun! Then later a couple of road bikes – one for the winter and an all carbon one for the summer days. My sessions in the gym allied with taking as little sugar as possible helped me to lose up to 10 kilos. Subsequently this loss has varied between 7 and 8 kilos but my sugar levels at my annual check up are below the trigger point for a diagnosis of Type 2 diabetes. As I have already posted on Les 5 I slipped on black ice on 2nd January 2018 and separated my quads from my left knee, so my major upper muscles were no longer connected to my knee. Fortunately I had brilliant care from NHS Scotland and a very talented surgeon who reattached my quads to my left knee. However, I also played my part as had spent hours lying down during my recovery period (three and a half months) I would have lost muscle power. Instead I walked and walked initially with two crutches, then one until I was able to dispense with these supports. 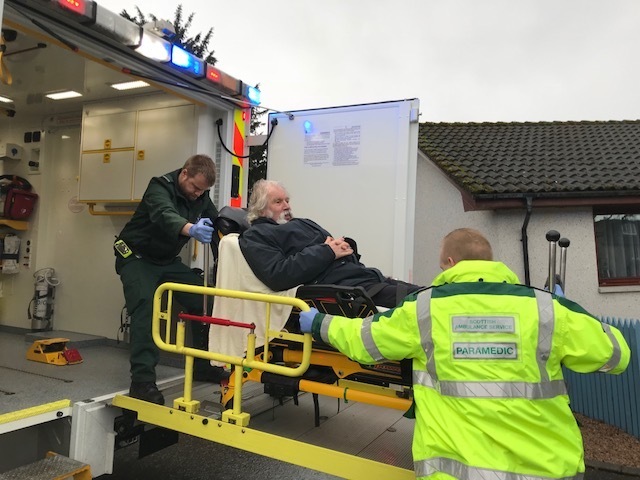 I was discharged as an outpatient at Inverness Hospital on 11th April and very soon placed an order for an e-road bike through Cadence Performance at Crystal Palace in South London taking possession in early May. Since then I have ridden over 1750 kilometres on it. Some might claim that using an e-bike is cheating. Given a combination of my age and the injury I would reject that entirely. I wanted a way of continuing to ride while not putting strain on my knee. My road bike has been brilliant I now have the freedom to tackle any slope, however steep – 20%+ is now entirely possible. These were hills that I could no longer contemplate with any sense of comfort. You still have to pedal but there is aid available. As you can see from the photo of the e-Pro Road Bike at the beginning of this post there is is no attempt to hide the battery pack. It's an e-bike and proud of it! e-bikes enable people of a certain age to either continue cycling in comfort as well as encouraging other to start or return to their bikes. 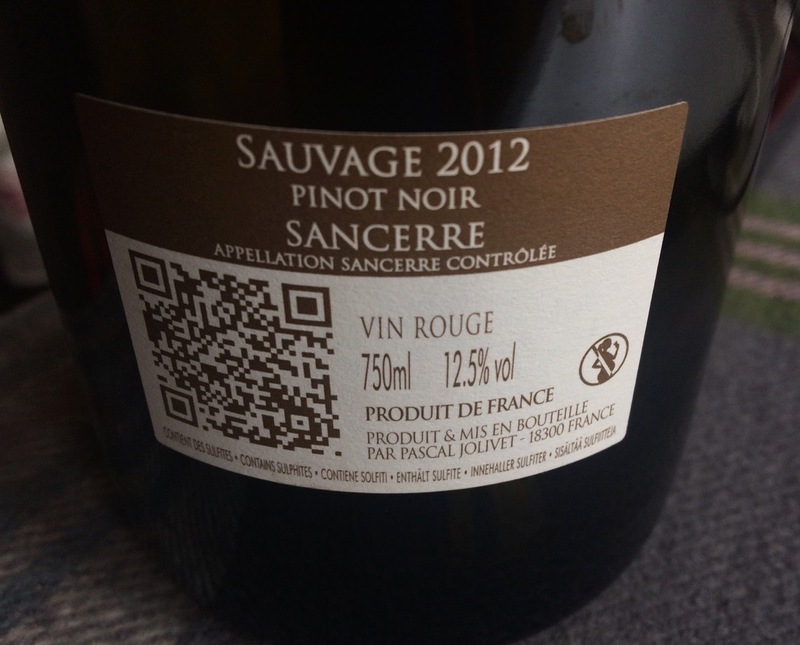 In all probability help riders to enjoy their wine to the full – which can't be bad!